It never fails – the moment you say Search Engine Optimization – or SEO – to a business owner, 99% of the time their eyes glaze over. It’s not completely a surprise, since aside from being an acronym, SEO can be seen as a murky, complicated area of online marketing that only technically-savvy people can understand. Surprisingly, much of this is untrue. To understand SEO, you really only need some common sense. To incorporate it, you need the willingness to learn and yes, some technical abilities. Pretty much anything you need to know about SEO can be found online if you’re willing to do your research. I Don’t Want to Become an SEO Pro – Why Should I Care? Before we get into what SEO is, you may be wondering why anyone other than marketing professionals should care about SEO. We often get clients who tell us, “I don’t want to know, I just want you to do it.” Of course, for clients who don’t want to be involved at all, we’re happy to just get the work done. However, we at MKT strive for transparency and results. We want to explain to our clients what it is we’re actually doing, as well as show them results on an ongoing basis. We do this because, like any industry, there are a lot of different types of SEO companies and consultants out there. Some of these companies are excellent and really know their stuff, while others are out to take your money and offer very little results or explanation. By having at least a basic understanding of SEO and how it works, you’ll know what to look for when you hire a SEO professional – and you’ll be able to tell if you’re getting what you’re paying for. We hope that after reading this article you will be able to enter into any SEO interview feeling more confident in knowing what you’re looking for, so you can make an informed decision that is best for your business. Anyway, when the Internet came along, it was only a matter of time before it quickly needed to have a hierarchy of listings. With thousands of websites being added to the search engines worldwide each day, search engines like Google needed a way to organize (or catalogue) the listings. They wanted to know which sites were legitimate, which ones were being updated, and which ones provided the best content to users. This necessity bred the beginnings of Search Engine Optimization. At the time, search engines decided the best way to rank sites this was to have people submit their sites, to let the search engines know they were there. Back in the mid-1990s, you would only have to submit your website address (or URL), to the search engines. From there, the search engines would “crawl” through your site, and index the information for the words it contained and any links. Your site would then be crawled on a regular basis. Website builders and technically-savvy marketing people (now called online marketers) quickly realized the benefits of taking advantage of these ranking factors. Many started taking shortcuts to rank higher faster, and in response search engines made changes to their ranking factors. Today, your website ranks based on the website itself (called Onsite SEO), as well as its reputation on search engines (called Offsite SEO). An optimized domain name: Avoid domains with hyphens and underscores. When possible, try to get domains that end in .com and .ca, and that meet keyword criteria (read on for more information about keywords – try to link to spot on page). XML sitemaps: This is a more savvy crawling mechanism. You create and upload an XML Sitemap (which is in an XML format) to the back end of your site and it tells the webmaster information about each page, such as when it was last updated and its importance. An HTML Sitemap is a general overview of the site (just the pages and the info a user needs to be concerned with). Both sitemaps should be created and uploaded to the back end of the site. Although a bit dated, you can learn more about the difference between the two sitemaps here. Robots.txt: This is a text document used to instruct robots how to crawl and index pages of your website. You can get your Robot.txt file created online for free (Google offers this service). Once complete, you should also upload this to the back end of your site, and be sure to verify your robot.txt once complete. Here’s some more information on this step. Schema markup: This is code that you put on your website to help search engines understand what your data means, not just what it says. For more information on schema markups, click here. Google & Bing Integration: Google and Bing, the two main search engines, have various products to help you connect with them and to track valuable information such as who is coming to your site, how long they’re staying and where they’re going. Be sure to set up your site with Google Analytics and Bing Webmaster Tools, and set up a Google Business Page as a minimum. We realize this is a lot to take in, so we’re saving Part 2 of this topic for another date. That’s when we tell you about the importance of Keyword Research, User Experience, Website Content and the need for Link Building. In the meantime, if you have any questions about SEO or website building, Contact Us. A former Journalist, Kamea has more than 17 years of experience in marketing and communications. She is an expert in creating and implementing short- and long-term strategic online marketing plans and campaigns that include all offline and online activities. As Project Manager, Kamea uses her excellent communication and management skills as well as her vast experience and knowledge in the various project areas to ensure the best quality projects for MKT clients. In addition to her efforts at MKT, Kamea is a partner in Women in Business Consulting, providing women with the tools and knowledge necessary to succeed in business. Kamea is a strong believer in giving back to the community. She sat on the board of directors for Junior Chamber International – Calgary Chapter for two years in a row, first as Communications Director, then as VP External. She is involved with Junior Achievement of Southern Alberta program, participating as a World of Choices Career Mentor and this year as a Company Program Judge in the websites category. 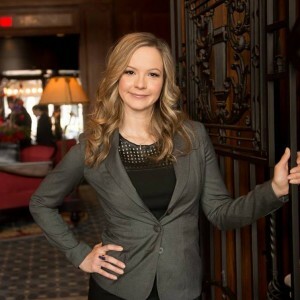 She is also an active member of the Calgary Chamber of Commerce and the Calgary Marketing Association. For fun, Kamea enjoys Running, she ran the Scotia Bank Half Marathon in support of Queen Ester Education Foundation, and reading mystery-thriller novels.